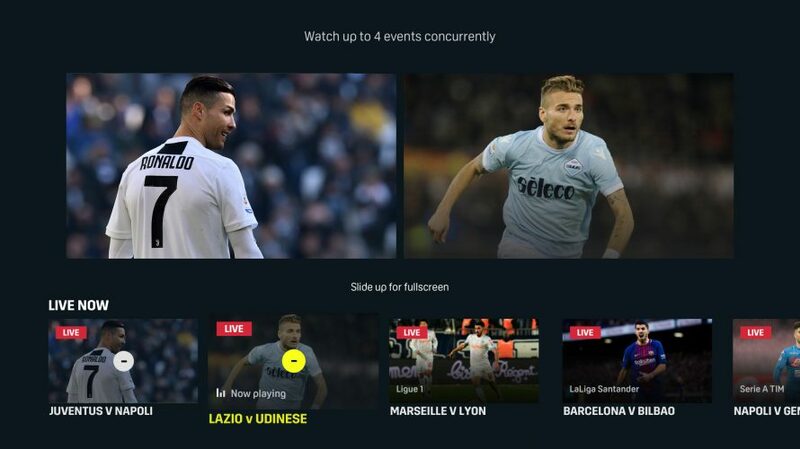 London, 6 February – DAZN, the world’s first pure-sport live and on demand streaming service, announced today an innovative new feature called ‘MultiView’ that enables fans to watch up to four live or on-demand events at the same time on one screen. In just a few clicks users can now enjoy an immersive multi-screen experience without the hassle of having to connect or cast to different screens. To activate the feature, users simply long press using the Apple TV remote and select multiple videos to watch. The ‘MultiView’ feature is currently available on fourth and fifth generation Apple TV devices to all DAZN subscribers in the U.S., Canada, Japan, Italy, Germany, Austria and Switzerland, and will launch in future markets Spain and Brazil when the service goes live. The announcement comes ahead of DAZN’s launch in Spain and Brazil. DAZN will enter the Spanish market with exclusive broadcast rights to stream MotoGP™, English Premier League and EuroLeague basketball. In Brazil, DAZN has secured rights to Copa Sudamericana, Serie A TIM and Ligue 1, with more major rights to be announced soon.